Innova Full-Face CPAP Mask, Sleep Apnea Mask, BUY Continuous Positive Airway Pressure Mask, Full Face Mask, DeVilbiss, 50848, 50849, 50850. 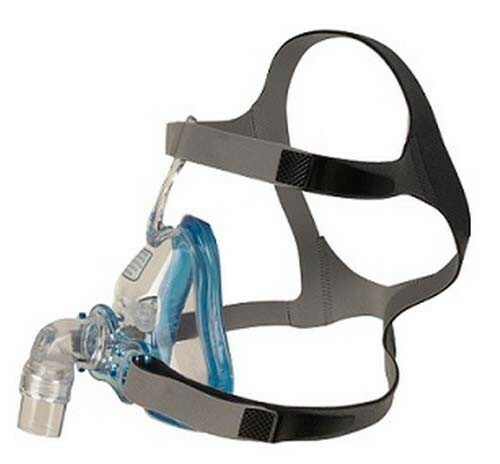 Innova Full-Face CPAP Mask, manufactured by DeVilbiss, is a full-face mask for a CPAP machine. You may select this product if you have sleep apnea. Featuring AIR gel with Advanced Cushion Technology and Active Headgear Connector, this full-face CPAP mask is incredibly lightweight and simple to use. In addition to being lightweight, the Innova Full-Face Mask features a unique Touchless Spacebar that eliminates contact with a patient's forehead. This allows for a more comfortable experience while wearing CPAP. Even though the mask is designed to not rest on your forehead, this mask has an Ergonomic Advanced Cushion Technology which allows for an effective seal and comfortable fit. Additionally, the headgear connector moves with a patient for a more reliable seal. To assist with keeping a secure seal, it may be beneficial for you to use a CPAP Pillow; these pillows have cut outs specifically designed for a full-face CPAP mask. The headgear features a quick release that will allow a user to easily slide off the mask with one hand. This is great if you need to remove the mask quickly in the middle of the night. Instead of having to replace the cushion or disassemble the cushion from the frame every time you need to clean the mask, the Innova has a permanent cushion design that melds both pieces together. In fact, this interface is so incredibly simple, that cleaning your mask is easier than ever. Truly, the Innova is innovative in every sense of the word. If you predominantly breathe through your mouth during sleep and need to wear CPAP, the Innova Full-Face CPAP Mask is a great choice. It is recommended that you replace the mask every 3 months and the headgear every 6 months. Can this mask be used if you are a side sleeper and breath threw your mouth? Full face masks are able to cover the nose and mouth; therefore users can expect it to operate properly for open-mouthed sleepers. The mask does allow for some movement from side to side as well. Best mask I have had. No leaks and very very comfortable. I highly recommend buying this. Suggest you buy an extra headgear with it to save shipping later.